FIDEHeaded for an epic finish. 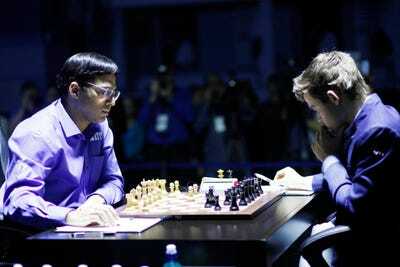 On Friday at the World Chess Championship in Sochi, Russia, challenger Viswanathan Anand of India and champion Magnus Carlsen of Norway wrapped up Game 10 with a draw — their second in as many days. Saturday is a rest day before the final two games are played under classical time controls: 120 minutes for the first 40 moves, 60 minutes for the next 20, and then additional time as needed. The score is now 5.5-4.5 in Carlsen’s favour. The 23-year-old World Champion can draw his way to victory: 6.5 points. For the 44-year-old Anand, there’s one final chance to play aggressively with the white pieces, in Game 12, to level the match. That’s if he doesn’t manage a win with black in Game 11. Carlsen obviously had a chance to all-but put Anand away in Game 11, winning a full point. For chess fans, this year’s WCC has been a vastly more enthralling contest that last year’s, when Carlsen grabbed he title in 10 games, effectively crushing a very shaky Anand. The Anand of 2014 is far more impressive. But Carlsen is also better. Carlsen’s main weapon again has been his tenacity: He’s made few bad moves, and when he did blunder horribly in Game 6, Anand missed a chance to win the game more or less in one move. Anand, meanwhile, has brought out his heavy artillery: His deep knowledge of opening theory, particularly in an opening known as the Queen’s Gambit Declined. Anand showed his hand right away by playing an aggressive Grunfeld line, the Russian variation, which involves the quick development of the white queen (as a rule, you don’t want to bring your queen out too early because she can become a target and you can end up being chased around the board as black achieves better development). Anand has just moved his knight to the g5 square. Optically, this position looks better for white. Anand has control of the d-file, with a rook protecting a pawn that’s already on the fifth rank. There are plenty of pieces seemingly a move away from threatening black’s king. And black’s pieces are disconnected, scattered over the board or huddled far from the white king. 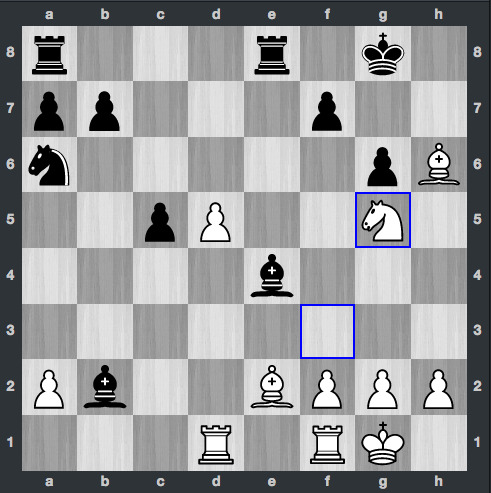 The black pawn on c5 is potentially a weakness. However, optics and reality are two different things. The powerful computer analysis engines that GMs and even amateurs now use to evaluate positions say that this one is essentially even. White’s dilemma is whether to get bold with the d-pawn, start thinking about doing something aggressive with the a-pawn, and maybe get his kingside pawns rolling, to bring additional attackers to bear on the black king. Any of those decisions could lead to a win. But because the players are even, white is going to have to find a modest edge and drive it home. If Anand can’t do that, it’s looking like a draw. If he make a bad move, Carlsen could go up a pawn and have a chance to win an endgame. Anand clearly wasn’t prepared to risk another loss, so he played safe and sealed the draw, knowing that he would get a least one last shot with white. The best Anand can now hope for is a tie for the regular time control games. If that match is deadlocked at 6-6, they will go to tiebreaks, and the chess will be played much faster: 25 minutes games, followed by 5-minute “blitz” games, and if needed, a sudden-death game. Anand was once called the “Lightning Kid” for his quickness at the board. So he knows how to play fast chess. But Carlsen, in addition to being the World Champion in classical chess, is the world champ in rapid and blitz chess. For chess fans, all we hope is that we get that far — or that Carlsen and Anand play a couple of wild games over the next two meetings. The stage is set for an epic finish to the Showdown in Sochi. And you can review Game 10 at ChessBomb.